"I don�t think anybody can really break Las Vegas. It�s just too big to be broken." I'm the least likely person to find in a casino. For one thing, I can't enjoy myself dropping quarters in a slot machine or playing black jack because I'm not comfortable losing any money at all. When you go to gamble, they say know how much you can afford to lose, and stick to it. Well, I can't afford to lose anything, even though I've got cash in the bank, because losing money makes my brain hurt. Compounding matters is the fact that I have horrible luck; I regularly can't break even when I've got 50/50 odds. So, giving that I hate gambling my own money away, why do I enjoy movies, documentaries and books about gambling? I can't really say. Probably for the same reasons I like the show Friends but find that I, personally, have no interest in developing an STD of my own. But I do love hearing stories about card sharks and master gamblers, people able to beat the odds in an inherently crooked business. Which probably does explain why I enjoyed Breaking Vegas, a History Channel documentary about a group of MIT students who managed to rip off Vegas casinos for almost a million dollars using an insanely complicated card-counting method. That they promptly lost it all right away, and that the team was mismanaged like a major corporation, just makes the story better. 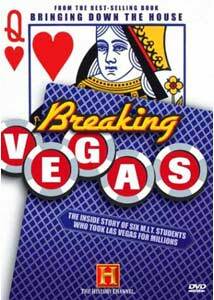 Through interviews with several of the relevant parties and ultra-corny re-enactment footage, Breaking Vegas follows the MIT black jack team from ambitious inception to untimely demise. As envisioned by a math whiz known only as Mr. X (who is interviewed shadow, and it still obviously a big nerd), the team consisted of a group of investors who would provide money to a group of about two dozen college students who were trained how to win at black jack and sent to Vegas with $125,000 stuffed in their pants. The card counting system required impeccable memorization and powers of observation to succeed, but it worked. It wasn't cheating�counting cards isn't illegal�but it was foolproof. Though profits would go up and down, statistically, if used correctly, the system would turn a profit. For a while, it did. But then, casino detectives, guys who spend all of their time hunting down people trying to rip off Vegas, began to notice these same young kids winning over and over, and the organization's days (and profits) were numbered. Breaking Vegas uses a glossy docu-drama format that is frequently cheesy and over-the-top, and it wouldn't work for most subjects, but who's ever going to accuse the Luxor or Caesar's Palace of being too subtle? Needless to say, dorky reenactments, the bad acting, and the hammy script all seem entirely appropriate, considering the subject matter. And if the material is askance of the History Channel's usually stodgy, videos to nod off to in world history class, well, all the better (not to worry, traditionalists�the DVD's bonus documentary is dry as toast). There is still a lot of interesting information, with interviews with the MIT players (some identified, some in shadow) revealing how math can do anything if you apply it correctly, and those with the Vegas detectives providing a glimpse behind the glitz of Sin City. The piece's "rise and fall" narrative is a little dull, but there are plenty of memorable moments, including the stories of the bad disguises the college kids tried out when they began getting recognized. It seemed they took the Sidney Bristow approach to disguises (aka "wigs and accents"). And there's also the story of the time Mr. X left a bag full of money sitting under a table in a college classroom, only to have it turned over to the IRS (which understandably had some questions about the college prof with $100K in cash). Because Mr. X may be good at math, but that doesn't mean he's a genius. Image Transfer Review: Breaking Vegas is, unlike many documentaries, a recent piece that doesn't rely on a lot of old footage, so it looks pretty clean on DVD. The widescreen presentation is anamorphically enhanced, and the cinematic lighting and high production values mean the washed out look of many low-budget documentaries isn't an issue. Nor did I notice any edge enhancement or significant artifacting, though dark scenes do tend to look a bit grainy. Audio Transfer Review: Audio is presented in a basic stereo mix that gets the job done. The interviews are voiceover narration sound clear and natural, and, when necessary, the front mains expand the soundstage with music and effects (mostly the warbling of casino machines). Extras Review: The extras consist of a pair of bonus programs only loosely related to the feature. High Rollers: A History of Gambling in America is your standard History Channel fare. The long piece (90 minutes) features lots of interviews with talking head "experts," lots of random footage of historical documents and artifacts, and the occasional reenactment, whether only with audio or with actors as well. There is a lot of interesting material, as the tradition of gambling in America is studied from its roots in Native American culture to some of history's most famous high rollers, from Alexander Hamilton to the card sharks of the Mississippi riverboats. But the narration is pretty hammy, insisting throughout that America's love affair with gambling can be explained by the actions of the first European settlers, who "literally gambled their lives in the New World." Yeah, Mr. Voice Over Narration. Those to situations are totally analogous. How to Win in Las Vegas, from the History Channel "signature series" Conquest, is a lot shorter and a lot less substantive, but also a lot more fun. A smarmy British host leads three clueless guys around Vegas and shows them, with the help of a poker champ, how to beat, or at least even, the odds in Sin City. I felt like I had at least a fighting chance at blackjack, craps, and roulette after watching these losers bet. One guy even managed to win several hundred dollars, before losing it all betting on black. For which he was soundly chastised by the smarmy British host. And may I say, there would be a lot fewer Americans with gambling problems if they would just keep a British guy close by to mock them when they lose. On the downside, none of the three programs includes subtitles, and only the main feature has a scene selection menu. Breaking Vegas is a glossy, entertaining documentary just cheesy enough to feel right at home on the strip.